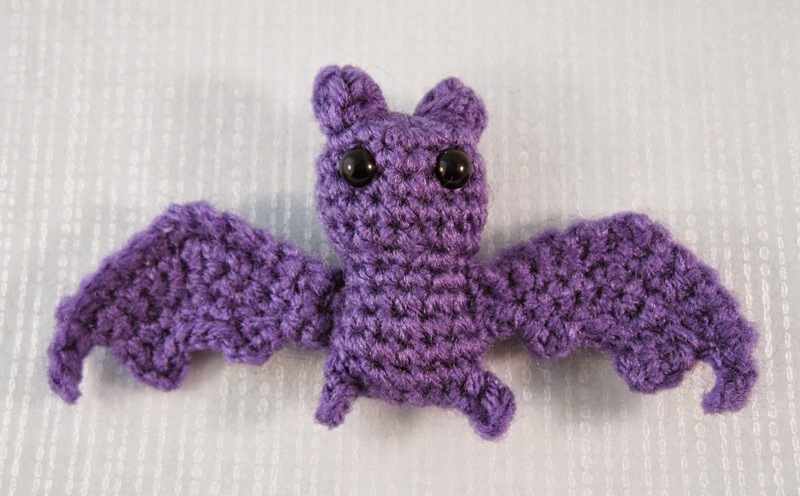 Well, Halloween is nearly upon us, so here is a tiny little bat pattern for you to have fun with. It's quick and simple to make and, depending on the yarn you use, will end up about 2” tall, with a wingspan of about 5”. 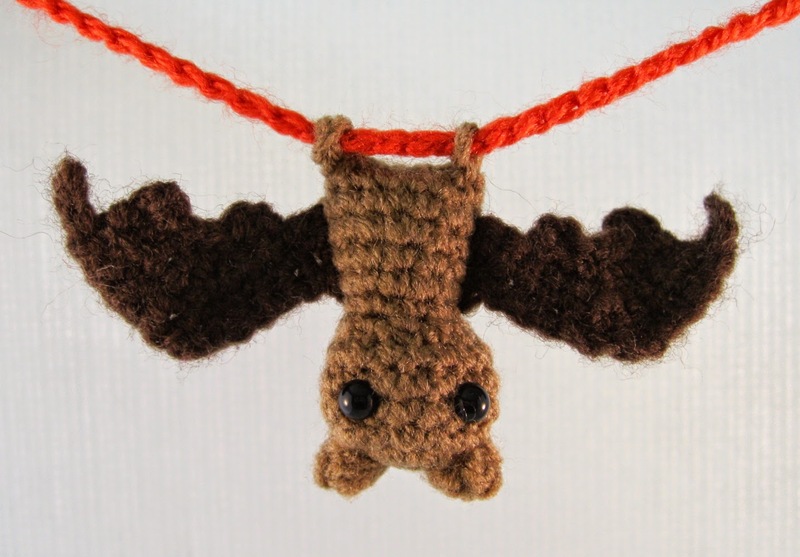 The feet are actually small loops, so your bat can hang upside down from a small stick or length of yarn or cord. The loops are large enough to fit the crochet hook you are using through, so you can use that to pull yarn or cord through. You could make several bats and hang them up on a length of chained yarn as decorations, or just wear one as a cute Halloween necklace! If you want to hang your bat on something thicker, just do more chain stitches when you make the feet in round 13. Work in rounds unless otherwise stated and do not join rounds unless told to. Use a stitch marker to mark the start of a round - a small piece of different coloured yarn placed under the stitch at the start of the round will do. To start a round, you can use the magic ring method, but I prefer (ch 2, work 6 sc into 1st ch). If you work the 6 sc over the tail of yarn as well you can use that to pull the hole tight. Round 3: [2 sc in next st, sc in next st] 6 times - 18 st. Round 4 - 6: (3 rounds) Sc in each st around – 18 st. Round 9 - 10: (2 rounds) Sc in each st around – 12 st.
Ss in next st then FO, leaving a length of yarn. Embroider eyes if you haven't used safety eyes. Stuff and use yarn to sew up the bottom in a line between the two feet. Es wird so lange in Runden gearbeitet, bis etwas anderes in der Beschreibung steht, es werden auch keine Runden mit einer KM beendet, es sei denn es ist so beschrieben.. Es empfiehlt sich, die Runden mit einem Marker, einem andersfarbigen Faden oder eine Büroklammer zu markieren. Um zu beginnen gibt es zwei Methoden: Den Magischen Ring oder 2 LfM anschlagen und in die erste LfM 6 FM einstechen. Immer durch beide Maschenglieder arbeiten. Stopfnadel, um die Flügel anzunähen und die Fledermaus zu schließen. Nähnadel oder Puppennähnadel, um Augen, Mund, Nase aufzusticken. 5 ST pop: Popcornstich für die Ohren. Nach dem 5ten Stäbchen des Popcorns wird die Häkelnadel aus der Schlaufe genommen, dabei die Schlaufe etwas größer ziehen, damit sie nicht wieder raus rutscht und man somit die Maschen verlieren würde. Jetzt wird die Häkelnadel in beide obere Maschenglieder des ersten Stäbchens des Popcorns eingestochen und die Schlaufe des 5ten Stäbchens mit einer KM durchgezogen. KM in die nächste Masche, ein längeres Ende am Faden lassen und abschneiden, anschließend durchziehen. Jetzt die Augen austicken, wenn keine Puppenaugen verwendet wurden und wenn gewünscht den Rest des Gesichts aufnähen/aufsticken. Mit Füllwatte oder Wollresten füllen und dann die Fledermaus am Boden, zwischen den beiden Füßen zusammennähen oder zusammenhäkeln. 1 FM in die nächsten 6 M, 1 LM (Wendeluftmasche), wenden. Reihe 5: 2 SteigeLM, 1 FM in die nächste M, jeweils eine KM in die nächsten 4 M, 2 SteigeLM, KM in die nächste M.
Den Faden mit längerem Ende abschneiden und durch die letzte KM ziehen. Das Ende der Wolle durch das Häkelstück zum Flügelende arbeiten, damit der Faden zum Annähen genutzt werden kann. These are just the sweetest! Thank you! I hope everyone had a good Halloween, with lots of bats! Thanks, I'm glad you're enjoying them! Love your critters! On the bat wing pattern: When I turn my work for the next row should I make a turning chain? Also, my wing came out very short compared to yours. Thanks! Don't do a turning chain unless it says so, sometimes you don't want them to create the shape. I'm not sure why your wings are turning out smaller - maybe try working a bit less tightly? Or, if they seem really out of proportion to the body, try making a wing with double strands of yarn. You could also go for a thicker hook. I tend to use 4.0mm for most stuff unless I use a yarn that I know isn't going to make it come out too small. I have got a question. 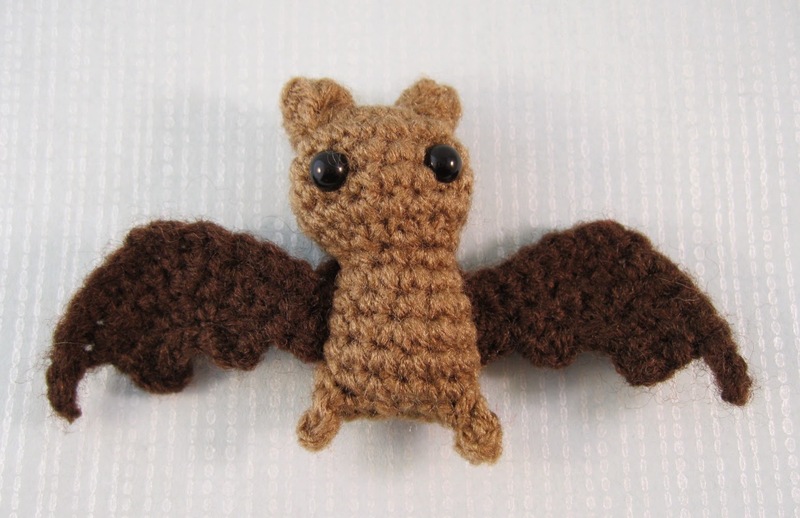 I'm a member of a crochet group on facebook and I did this lovely bats and showed them to the group. Now, the members want to crochet them, too. But most of them don't understand English. My question is: Am I allowed to translate your pattern into German an afterwards post it to the group so that the members there can crochet the bats. Hello Anett, yes, that would be great! Let me know when you do it, and I will include the link to your translation on here and Ravelry. That's so great. Thank you very much. I postet the translation to the facebook group, but I'm afraid non-members can't see the translation because it's a closed group. But it'll be great if you include the link to the translation. Thanks, I've got the files. I simply wanted to ask you if its okay if I said the similarity is a random fact. And I don´t going to post the pattern somewhere. I'm happy for people to make and sell items from my patterns, so don't worry. Also, this is quite a simple pattern, so if you came up with something very similar, that's not surprising. Thanks for sharing this pattern. I recently made a whole bat family. Daddy, Mama, and baby :) It is a quick and easy pattern. Just right for me! That sounds cute, I'm glad you're enjoying the pattern! Do you have a german translation for these cute bats? Emelire - good tip. Everyone crochets slightly differently, and the look of the wings might change depending on how you work into the chain. Kirsten - no German translation I'm afraid. I'm very happy if anyone wants to translate any of my free patterns into any language. If they do, I put the details on the Ravelry page for the pattern so you can see if there's a translation. Thank you, made a bat at the weekend after finding it on my mobile for my little grandson. He loves it! Omg...these are adorable!! I can't wait to make some for Halloween! :). Thank you for sharing your pattern with us! Thank you - have fun with them! Just curious, on round 7, it ends up being a round and a half, if we're to dec every other stitch. I'm on my third one, a brown one, the first two were an almost black with sparkle yarn. Between myself, daughter, and about three friends, we all love bats! And why wait til closer to Halloween to start making them?! I'm having fun now! Thank you so much for this pattern. This is the size bat I've been looking for, PLUS he(she) looks realistic, not the round ball ones that I've seen. (Yes, those are cute, but I want real) Thank you again!! My bad! I read row 7 wrong, thought it said (sc, dec) 9x, but I see now it's (sc dec) 9 x... Oopsie! I'm glad it makes sense now, and so pleased that you're enjoying the pattern. I think bats are lovely creatures, so they're fun all year round, not just Halloween! I would understand the German pattern better than English, is it possible for you to post it here? I have just added the German translation, thanks for reminding me to do it. Love these. Just made 4 because they're quick and easy. Thanks for the pattern. These are super cute. Is there a favorite kind of yarn that you use? Or would any black, light or dark brown be okay? Thanks! I tend to use straightforward acrylic yarn, so yes, any yarn the right colour would be fine. Double knitting weight or similar. Started crocheting 2 days ago and I made one of these. Didn’t turn out quite as good as yours, but I think it’s cute. Thanks for the free pattern!! I've found your patterns and want to ask you, if i may use them for my Kids-Crochet-Circle in my Library. May i translate the Pumpkin-Mice into german? I can send you of course my translation for your own use like Anett. That would all be absolutely fine. I'd love to hear how it goes, and if you do a German translation of the Pumpkin Mice, let me know so I can share it. I noticed that if you make both wings the same one will be showing the good side and one will be showing the bad, but in your pictures they are both showing the good side. What do i need to do for this?